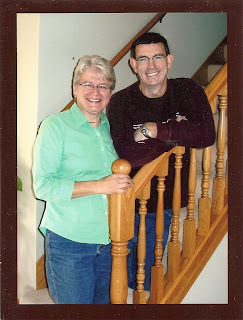 Long distance Birthday wishes to our Pastor(pictured with his bride, Karen) in Minneota - HAPPY BIRTHDAY PASTOR RICH! We love you. Britt is studying for ACT re-take. Getting slightly worn out by it and a teensy tiny bit grouchy here and there. Paige completed Sixth grade science. She got a 100% on her final test. She is down to grammar and Math now. This morning when given the very last of the juice in the house, Noah was told NOT to say anything about it to the other people in the house who were not getting juice. Troy said "just don't point it out, pretend there is nothing in your cup." Noah walked into the room with cup held high above his head saying "There is nothing in here. There is noooootttthhhhing in this cup." He is lucky he did not get beat-up and have his juice stolen from him. Phoebe Joy is 7 months old today. 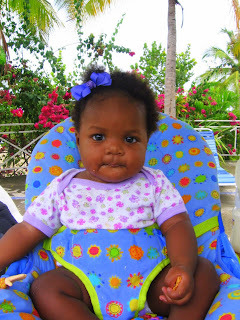 She weighs 19lbs and is 27" long.No one would ever accuse her of being a light eater. She is one solid chunk of lady. She is getting very close to crawling. If only her belly did not get in the way. She wants to try all table food, has NO INTEREST in being spoon fed. She wants a bottle OR whatever we are eating. The whole world is watching how we love one another. Jesus gave the world the right to judge the authenticity of our faith by how much we love other believers. We prove our faith in Christ, not by the rules we keep, but by the love we give. Notice Jesus didn’t say, “Love me,” as proof of our discipleship. He said, “Love one another, and that will show the world you belong to me.” Our love for one another is a tangible reflection of God’s love, allowing the world to witness the power of transformed lives. Before we ever engage our neighbors about the truth of Christ, we already are telling them about God’s love by the way we love each other. Until the world sees the love of God modeled in Christian community, they’re going to have trouble believing it could ever exist. When we care as Christ for one another, we show the world a love so authentic and contagious that they can’t help but be attracted to it. · Use words, if necessary – We make a statement about God by the way we love one another. It may be a positive statement or it may be a negative one, but the fact is that people often form their opinions of God based upon our individual reputation: “You may be the only picture of Jesus people will ever see.” Or they may form their opinion of God based upon the reputation of our congregations – how we get along, how we support each other, how we criticize, how we love one another.